Picture blog: live from Sony's Tokyo HQ | What Hi-Fi? We're at Sony's Tokyo HQ all this week, getting the inside info on the company's TV strategy, forthcoming 2012 TV range and other new products heading to the UK later this year. Some of what we're being shown is so secret it's covered by a non-disclosure agreement (NDA), but here are some pictures we managed to snap during this morning's session on Sony's design strategy. As you'll see from the pictures, Sony isn't going down the super-slim, bezel-free design approach of arch-rivals Samsung. Instead, it's sticking to its Monolith design launched in 2010, with the screen angled slightly backwards when placed on the stand. Fumiya Matsuoko, Sony's art director, home products design group, says the design philosophy behind the new models can be summarised as "minimal, simple, tranquil" – and also "masculine and solid". Just don't tell that to the women in your household. Sony's KDL-HX850 Monolith LCD/LED TV (above) will come in 40, 46, 55in sizes, and has a 'floating' aluminium stand as standard – the TV hovers above the stand, rather than dropping into a groove as it does on the current model. There are two very small horizontal speakers built into the stand (the vertical ones you see either side of the TV are optional), a subwoofer round the back, and it's all connected to the telly with a special cable. The Sony KDL-EX650 has a dimpled surround ‘tension surface’ (not that you can tell from this photo) and will be sold in 22, 26, 32, 40, 46in screen sizes. It uses a much simpler stand design. Just to the left of the TV is one of Sony's new slimline 3D Blu-ray players. There'll also be a non-3D entry-level player. More details here. Sony has developed two prototype Blu-ray home cinema systems. The upmarket model (above) has a brushed metal finish and will be sold in Europe as a 2.1 system. It can be had with satellite or tallboy speakers. The entry-level BD system (below) is a 5.1 set-up and has a more basic plastic finish, albeit with a faux 'brushed metal' surface design. There's more info on these systems, plus UK prices and release dates, in our CES news story. Sony's Google TV set-top box and touchpad controller (below) will land in the UK later this year. Initially we were told spring, but it now looks more likely it will be late summer. Expect two models, one just a streamer, the other with built-in Blu-ray drive. The latter will cost around £300. The back of the Google controller has a full-sized Qwerty keyboard. Handy for texting while you're watching telly. These super-light 3D active-shutter glasses first went on show at CES back in January – UK pricing to be confirmed. Definitely not coming to the UK, but still worth a mention, is this giant iPod boombox. To get an idea of the size of the thing (and it's definitely not portable! ), your iPod/iPhone slips into that slot on the right below the controls. Subtle it ain't. We've also seen the new Sony KDL-HX750 LCD/LED TV, which looks similar to, but has a slightly different stand design from, the KDL-HX850 model at the top of this blog. It will be available in 32, 40, 46 and 55in screen sizes. 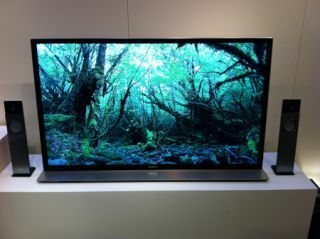 Sony says its new TV range will go on sale during the first half of 2012. You can find more details of UK release dates and prices in our CES news story. We've got another session this afternoon on picture quality and the technology behind Sony's 2012 TVs, so we'll report back on that as soon as we know more.